Ellen Emerson White has written a number of books about Vietnam; the Echo Company series, written under the name Zack Emerson; a book written under EEW, about a nurse in Vietnam who has a tough time adjusting to life back home; and two Dear America books. These books introduce Michael Jennings. Michael is a pretty normal 18 year old; college wasn't for him, so he decided to hang out, work at the ski lift. Problem is, it's 1968 -- so he's drafted. And now he's in Vietnam. He doesn't really know why or care why he's fighting. He just wants to do his time and go home. And he knows he should have gone to college, but he didn't see himself as college material, and now he's paying the price, isn't he? God, I love Michael. As with most of EEW's characters, he's funny and a smart aleck. And smarter than he realizes. Welcome to Vietnam starts almost as bad Vietnam war movie. Micheal goes to Vietnam! It's hot! He lugs a lot of stuff around, people fire at him, he fires back. Some race issues crop up. He bonds with the other guys in Echo Company. And you think, yes, EEW did her research and did it well, but it seems, kind of, I don't know? Clean, despite the dirt and the leeches and the jungle rot. And then, towards the end of the book, BAM. "The sound of the explosion sent everyone diving to the ground, looking for cover. And at first, when -- stuff -- rained down, Michael wasn't sure what it was. Then, he realized who it was. Who it had been." Finnegan had been standing next to JD, the dead soldier: "Finnegan, who had been closest to him -- yeah, more ways than one -- didn't seem to be hurt, but he was covered with -- stuff. With what was left of this best friend." Michael takes his canteen, and starts washing off the remains. He fills a body bag, with EEW using very few words but packing quite the punch, especially as Mike and another soldier pretend the bag is heavier than it is. So that no one realizes just how little is left of JD. It's real. It's death and dying and blood. And EEW doesn't shy away from any of it. And what she has done is take you into the experience; just as Michael (and the reader) has the lull of "ok, this isn't so bad after all, I can make it" BAM. No. It's not OK. It is that bad. This is one of the few war novels I have read that respects the soldiers and their experiences; that doesn't play politics about the issue of war. And is brutally honest about the soldier's experiences. The other three books continue the story of Micheal's first months in Vietnam; his first battle, meeting nurse Lt. Rebecca. Phillips. It ends -- if not happy, then optimistic, because he's met Rebecca and most of his friends are alive. His tour is far from over. But it's right before Tet, and everyone knows that nothing is going to happen during a major holiday, so Michael and Echo Company are on "stand down," enjoying a vacation. And the series ends. Most readers realize what happens after the series... the Tet Offensive. It's like ending the story of a happily married couple as they set sail on the Titanic. The story gets continued in The Road Home, which is Rebecca's story. Rebecca, the army nurse that Michael met. It starts up after the series ends ... which means hello, Tet Offensive, plays a major role. And you find out what happens to Michael and his buddies. I'll tell you this: Michael doesn't die. But be careful about getting to attached to the others. I read The Road Home first, even tho it was written after the first four books and is set after the first four books. That's because the first four books were published under a different name -- Zack Emerson. 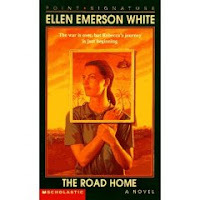 So, I read The Road Home without reading the first four books; and The Road Home made perfect sense. It worked wonderfully as a stand alone. While I tracked down the other titles because I'm a bit obsessive compulsive that way, I didn't have to read them to understand the story. I've said it before, and I'm saying it again: EEW's newest book, Long May She Reign, stands alone. Just like The Road Home stands alone. Another similarity between the two: both are "crossover titles," with appeal for both adult and teen readers. Since I have proven my obsession with EEW's writing, why, you may ask, did I not read the first four books? Because they were published under the name Zack Emerson and I didn't know about them. Rebecca Phillips is wrapping up her tour in Vietnam as an army nurse. She's been thru a lot; she's seen a lot. Friends have died; she's seen things ... she's done things ... the scars are physical and mental. And home... home isn't just getting into an airplane and going back to the house you grew up in. It's going to take a lot to finally be "home." One of my three favorite books by Ellen Emerson White. It also features one of my book boyfriends, Michael Jennings (so many book boyfriends, I'm like the blog equivalent of Bill Henrickson, except with multiple book boyfriends instead of multiple wives). Michael was a soldier Rebecca met in Vietnam. She's trying to make sense of her life (and of Vietnam), and so she decides to visit him. Thing is, he's as scarred and messed up by Vietnam as Rebecca, maybe more so. Why is this a favorite? For some of the same reasons that China Beach is one of my favorite series, ever. By exploring the Vietnam War thru the POV of a female, and of a nurse, there is the horrors of war combined with the healing of medicine; the mixed emotions of saving the lives of soldiers, only to have the soldiers go out, risk their lives again, or to kill. And the details, of triage, of deciding who lives and dies, who gets morphine and who doesn't, who dies alone or dies with lies of "it's going to be OK."
Rebecca goes from naive and hopeful to scared, afraid, bitter. EEW does a masterful job of showing both that war is hell AND respecting the soldier. Based on when her books were published, EEW is in my age group; yet, when my mother read this book, she was convinced that EEW had to have grown up during the Vietnam era, because EEW captured the times and the conflict so clearly. And then she continues it thru past the "happy ending" of going home... and shows just how hard that adjustment was. And, of course, there are Rebecca and Michael. A bit of an odd couple; she's older, she was a nurse, he's a few years younger, he never went to college. Yet, they share not just the experience of Vietnam, but also a sense of humor and way of looking at the world. A sense of humor almost lost, but waiting to be rediscovered. The only problem with this book? It ends. EEW revisited not just the Vietnam War, but the year that Michael is in Vietnam, in her two Dear America books, The Journal of Patrick Seamus Flaherty: United States Marine Corps Khe Sanh, Vietnam, 1968 (2002) and Where Have All the Flowers Gone? : The Diary of Molly Mackenzie Flaherty, 1968 (2002). For the record: how, you may ask, can the Dear America story tell of the Vietnam war without those things present in the Echo Company / The Road Home books? The f*cks and drugs and prostitutes and violence other things? Because the gimmick is Patrick isn't just writing a diary; he's been told to write it with the knowledge that his youngest sister will read it. So Patrick leaves stuff out. These two books, written for younger readers, are significant in EEW's work for a couple of reasons. First, they are one of the few companion Dear America series; Patrick and Molly are siblings, and these books tell about the same year from their two different POVs. Hm, you see; just as EEW did with Life Without Friends and Friends for Life, reviewed earlier this week. Second, they contain references to the earlier books. I know! Because it turns out that Patrick is friends with a soldier in Echo Company. And this other soldier isn't a big part of either Patrick or Molly's stories, but it does give the reader some information on another one of Michael's friends who made it home. Oh, and Patrick, Molly, and Finnegan are all from Boston. And remember, in Friends for Life, (which is set in Boston) Susan's boyfriend? Patrick? Patrick's last name is Finnegan. I don't care what Ellen says in the comments about coincidences, I'm convinced the Finnegans are connected. Also? Just because I love Rebecca & Michael, and because EEW does the Madeleine L'Engle/ Sarah Dessen thing of mentioning people from other books, I know wonder if these two will pop up somewhere. Links to other Under the Radar Recs will be added after work. Did you really just make me want to read a bunch of book about the Vietnam War? Seriously? Damn, Liz, you got mad skillz. You make me want to just drop everything and dig up this author and go on an author binge the likes of which I haven't done in YEARS. Rebecca has actually popped up--briefly--in two other books so far. She's mentioned in All Emergencies Ring Super--and is the doctor who apparently scrubbed in on Mr. Callahan's emergency surgery in one of the Santa Paws books, and comes out to talk to the family in the ER afterwards--acting and sounding precisely like herself, albeit much older. (By the way, I _only_ wrote the Nicholas Edwards books in that series, about my beloved dog Zack; I just recently found out that someone else had written several others, under a slightly different name, and entirely destroyed the characters/concept) Right now, I'm thinking of making Rebecca's daughter (?!) a key character in the long overdue second adult mystery. Which I, um, have to write. Ouch. Until I wrote Long May She Reign, I didn't think I would _ever_ enjoying writing a book as much as I enjoyed writing The Road Home. Moped around with writer's block, missing Rebecca as a lead character, for quite a few years, doing pay-the-rent books, actually. Much food for thought in these reviews; thanks. The Major is the character who _really_ stays with me, in the Vietnam series, as it happens. Rebecca's daughter...yay! I can only imagine how cool she would be. Would this be related to All Emergencies Ring Super at all?